This is a home-from-home family caravan. It has been upgraded with new carpets, blinds and curtains. 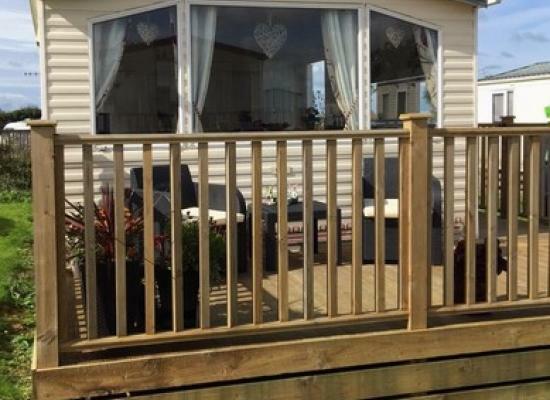 It is situated within a quiet owner area of Newperran Holiday Park. Previous families have been thrilled with both the caravan and site. Newperran Holiday Park is a peaceful family holiday park, with breath-taking open countryside and sea views ideal for any Cornish destination Your stay at Newperran with its warm and friendly atmosphere will be a holiday to remember. With a modern indoor deck level heated swimming pool and toddlers heated paddling pool, there is an adventure playground and a toddler’s adventure play area in the Devoran Field for the children to enjoy. Newperran holiday park, has something for all the family, with great modern facilities including a comfortable Cornish pub/restaurant, Shop, Launderette and games room, there is lots to keep everyone occupied for the entire stay.